No matter what we wear, we all think about fashion to some extent, even if it’s just to give a shirt off the floor the sniff test to see if it can go another day. To be honest, I find the whole “no judgment” trend seen on various blogs a bit disingenuous. We all judge each other’s appearance. We’re hardwired to do so, if only to weed out safe people from unsafe people. And most of us judge ourselves more harshly than we do strangers. Thinking about what we wear, as well as our sources of inspiration for our fashion choices, and how we judge ourselves and others, is the topic of a couple of books I’ve come across lately. Women In Clothes, edited by Sheila Heti, Heidi Julavits and Leanne Shapton is a massive tome of snippets from a massive survey about clothing completed by hundreds of women. Questions range from familial influences to admiring women on the street, the difference in taste versus style, the process of getting dressed in the morning, political messages within clothing choices, etc. It’s extensive to the point of exhaustive, and must certainly have been overwhelming to many of the women who completed it. While individual surveys are included within the book, in order to include as many respondents as possible, chapters are arranged by theme; for instance, three pages of quotes from the surveys on “glamour” or “dressing for success”. I liked these a lot, since it was fun and interesting to compare different approaches to the same issue. Interspersed with these sections are conversations/interviews with notable respondents, and the editors have mined their personal contacts to bring in names such as Tavi Gevinson, Molly Ringwald and Kim Gordon. Visual elements come into Women In Clothes in the form of photos of respondents’ mothers, a fun switcheroo photo-essay in which six women try on each other’s favourite outfits, and photos of “collections”, a series that was both hit and miss for me. In some cases the collection demonstrated the respondent’s approach to building a wardrobe, while in other cases, such as a collection of eight (!!) beige trenchcoats, pointed towards some unhealthy hoarding tendencies. I could also have done without the “collection” of someone’s flossing sticks, empty gum packets or smoked cigarette butts. I suppose this could be justified as fashion, but it mostly felt like a 1st year art college show. This inclusion of what seemed like really unnecessary things is a theme that runs through Women in Clothes. At just under 500 pages, I felt that it could have been cut back by 100 pages or more to the benefit of the overall book. I also found the layout very cluttered and I’ll admit that there are whole pieces that I skipped completely because they were laid out along the bottom of pages in the style – and font size – of footnotes. Y’know what’s not fashionable? Eyestrain. The strongest pieces within Women In Clothes are when respondents extrapolate on a subject in the form of an essay. This felt like more of a window into the individual’s style and personality than anything else, especially since the list of survey respondents is a single bio line each. (Surveys can be found online in full, sortable by author or question.) I especially like Mansoura Ez Eldin’s piece “I Refused” about wearing the hijab and editor Julavits paranoid story about some lost mittens. 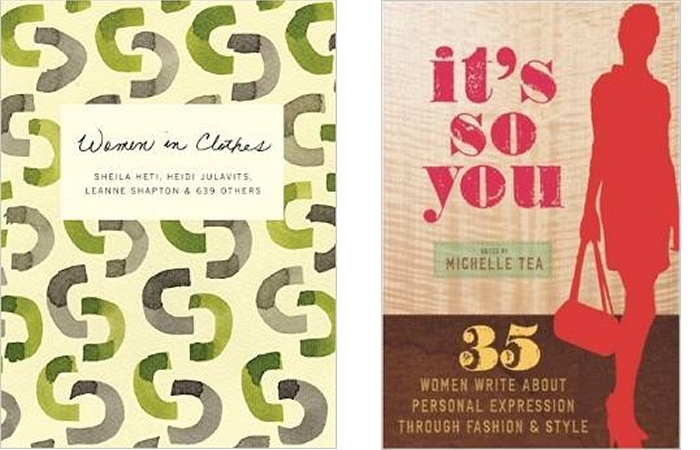 Since the essays were more to my liking, I then sought out It’s So You, a 2007 collection of essays about personal style edited by author Michelle Tea. The 35 contributors ranged from models to trans women, lesbians to cis-straight women and from a wide range of ethnic backgrounds. While a chunk of the essays run along the theme of ugly ducking kid (fat, poor, awkward) finding their own style, usually through the punk, alternative or gay scene, I also loved the pieces by comics queen Trina Robbins on her favourite thrift shop experience, and beat poet Dianne DiPrima on the evolution of her personal style over the decades. And the brilliant Cintra Wilson on the general weirdness of her wardrobe. It’s So You definitely has more appeal for the fashion outliers, the folks who might think to make jewellery out of toilet paper rolls or who want a form of style self-expression outside of the mainstream. The book, while it can be a tad repetitive, mostly because it seems to have sought contributors primarily from within the San Francisco alternative scene, is in many ways inspirational, dealing as it does with issues like dressing an especially tall trans-gender woman, or a fat women coming into her own when she realizes she doesn’t have to try and dress like everyone else. Both books are worth checking out, but each speak to a different target audience. The respondents who completed the survey for Women In Clothes may or may not be happy with their personal style. Additionally most of the women exist within the mainstream, or even conservative cultures, where they may never be allowed full self-expression when it comes to their appearance. It’s So You, on the other hand, is mostly about a group of people comfortable with their own style and appearance telling the stories of how they achieved that.